Protestors in hundreds have gathered at Dispur in Guwahati, the capital city of Assam in protest against the proposed Citizenship (Amendment) Bill, 2016. The protestors belonging to Krishak Mukti Sangram Samiti (KMSS) and 70 other indigenous organizations of the State have congregated from several places across the State. These protestors have taken out ‘Sankalpa Yatra’ for the last four days from several far-off places, like Sadiya, Dhubri, Dhemaji and other places. The protestors have gathered at the Ganesh Udyan in front of Ganesh temple at Ganeshguri close to capital complex. The protestors have rent the air shouting slogans denouncing the Sarbananda Sonowal government. 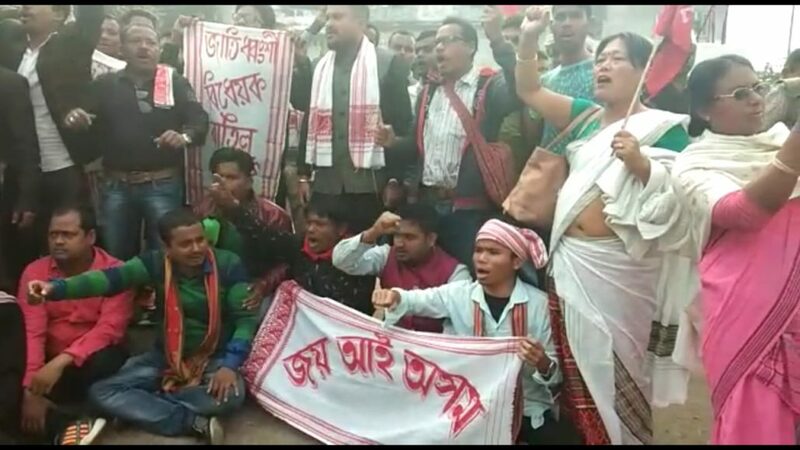 KMSS leader Akhil Gogoi who is leading the protest said that if the Citizenship (Amendment) Bill, 2016 is adopted then Sarbananda Sonowal has no right to continue as the Chief Minister of the State. Akhil Gogoi further asserted that no force can suppress the voice of protest of the common people. He also said that they will go to any extent to protect the integrity of the State and no protestor has the fear of death. He further alleged democracy has taken a backseat in Assam and the present government is bent on imposing autocratic rule. He also said that as the administration has granted permission for the demonstration, they have all the right to stage a peaceful democratic movement. He also questioned as to why the Assam Police have made such elaborate arrangement deploying huge contingent of armed personnel at the protest venue. Earlier, protestors of the ‘Sankalpa Yatra’ were detained at several places and massive barricades have been put at the entry points of Guwahati with huge contingent of Assam Police battalion and CRPF personnel.